As you know we sadly lost our dear Sasha on July 5th. 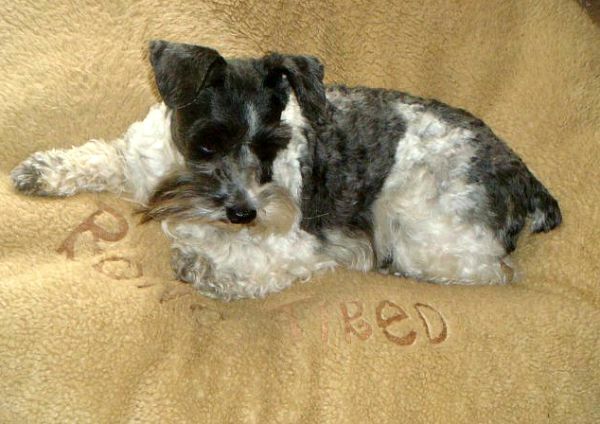 Lacy, our white Schnauzer has doggie dementia and now Chloe, one of our toy Schnauzers came down sick. We noticed in the last few days, we wasn't her usual self. Sleeping a lot and not eager to eat. We as dog owners notice when our pets aren't feeling well. I tried to look in her mouth to see what color her gums were. She didn't like that. The gums should be Bubble Gum pink. We also noticed one eye was red. We called our vet and took her in. The vet looked her over and found she had an infected tooth. He recommended she have her teeth cleaned the next day. When they clean your dog's teeth, they sedate them...safe for all parties. We took her in yesterday and picked her up later in the day. The vet said more teeth were infected! How does this happen before our very eyes? They pulled 7 teeth....YIKES! Dogs have a total of 42 teeth. If you look in your dog’s mouth you will notice one tooth that is much larger than the rest of the teeth. It is on the upper jaw, about half way back. It is the fourth premolar, sometimes referred to as the carnassial tooth. See that swelling in the picture on the right, it was affecting her left eye......cauising it to be red and bulging. Infections in these teeth show outward symptoms, such as the red eye...causing us dog owners to think our dog has an eye infection. As soon as we noticed Chloe's eye was red, we called the vet. 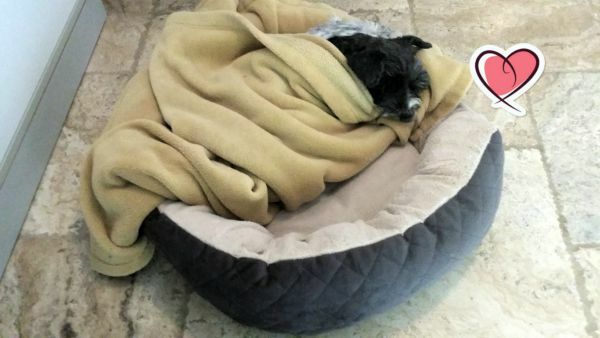 After the surgery, Chloe was put on pain meds and antibiotics. She is resting at home, where she is the most comfortable. It's interesting to think how dogs can get so many diseases like humans. I hope things get better regarding our fur children. Thanks for reading. I hope you are not bored by sharing our trials with our doggies. They are a big part of our family. Aw, poor little Chloe. That's terrible to have to have 7 teeth pulled. But I hope she heals and recovers quickly. You are really a Schnauzer lover, aren't you, Linda? They are something else. I still miss my little Chloe Dawn daily. I hope your heart is healing some. It's so hard with our little fuzzy faces get older and get sick. So sorry Linda. They are our family. I was praying you weren't going to say she had contracted the doggie flu that is going around. That is just awful. Glad she will be ok.
As I've mentioned before, we have 2 grand-doggie Schnauzers and our Maddie just like your dear Sasha did. Zoe looks much like Chloe but not nearly as much white. It is fortunate that the teeth problem was discovered and treated. Lacy's dementia problem is so familiar to us as our 11 year old dachshund Milo has it. It was soon evident after we adopted him and his brother at 9 years old that something was wrong. Every evening it was like his personality would change. The vet put him on one med that he could not keep down so now we have him on amitriptyline, only 1/4 th a day and it has worked wonders on him. It hurts so much to lose one of our dear fur babies. I'm going to send a link of your post to my daughter. 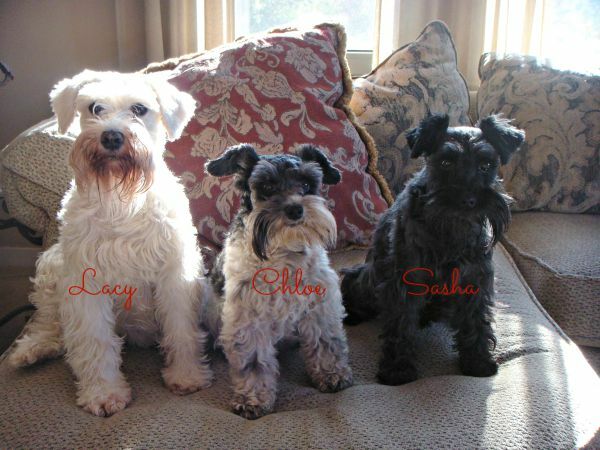 They are considering adding a standard size schnauzer next year to their two mini girls. Awww, poor Chloe! I am glad it wasn't something more serious that couldn't be addressed. You two fur parents have been through enough. Hope she feels better soon! Poor baby! I hope she gets better soon. I have a cat with dementia and he is not eating like he should either. He is old but still 'OK' and when he is not, I'll do what I have too. It's not easy is it. Truly..because I feel so much for her. Poor little Chloe, hope she is doing better since the extractions and antibiotics. Awwww...how awful for you to have sick fur babies. And how terrible for Chloe with the infected and now pulled teeth. Awwww....bless Chloe's heart. My heart goes out to you, Linda, as being a fellow animal lover and having had cats most of my life, I totally understand. Hi Linda, good to know that Chloe is now on the road to recovery. I am sure that she is more comfortable with her family and dear ones looking after her. Oh my goodness, Linda! You truly have had your hands full with your beautiful little friends. So glad to hear Chloe is on the mend after such an ordeal. Sounds like you have a great vet and that is so important. Oh my Linda, poor Chloe, with the infected teeth and the extractions. She is so lucky to be home now and in her loving, caring environment that you and your hubby provide. Poor fur baby! I'll be she will feel much better as soon as her mouth heals. Linda, I'm glad you got her in to see the vet ,and that the vet could treat this. Hope Chloe is on the mend and feels better soon. I agree, our pets are family. Thinking of you with the loss of Sasha. Take care. Hi Linda, Oh I'm so sorry to hear about sweet Chloe and her dental problems. Yes, they are just like us humans and issues can happen fast. So glad the vet took such good care and she will be on the mend now at home with your love and care. Poor baby. Give her a little soft pat from me. Take good care Linda. I know you've had a lot lately with your fur babies. Blessings and puppy prayers for Chloe. Ouch 7 teeth- that's a lot! One of my pets lost three one time. Poor little ones don't complain and then all of a sudden something's really wrong. Good thing you took her in. I'll have to remember the part about the eye. I hope she's feeling better and gets back to normal quickly. How difficult! Sweet thing! So hard to see them suffer. They give so much love and comfort, and we feel so deeply for them! Hope the recovery is quick! Hugs, Jacqueline! aahh, your poor little doggy. I do hope that she feels better soon. Dogs soon become part of our family, and we love them so much. I didn't know they had so many teeth! She looks precious in these pictures. Thank you for visiting today. I hope you get to see all your places you dream of someday. Oh, so sad to hear about your poor little doggy! Heartbreaking when they are hurting. Just got back in town from visiting our daughter in Edmond Oklahoma. I am so sad that your little puppy is having such a tough time, but she has such a good Momma (sweet you) that she will be better in no time at all. Sending hugs to all of you and good wishes for a speedy recovery too. Poor baby. Hope she's better now. I fully understand how these little fur babies become family. We love ours to death.